In these days of fast food, TV dinners and reconstituted mechanically-recovered-offal-based microwave Snack Tubs, it is becoming increasingly difficult to ensure a properly balanced diet. For kids, the temptation to pig out on burgers and treacle-coated Munch Bars is even greater, and parents face a never-ending battle to persuade them to eat a proper, healthy, lard-based meal. Well now those days could be over, thanks to the good people at Funmeals, who are about to introduce a new range of products aimed at bringing children back to the dinner table. We invited spokesman Jack Zannussi to tell us about it. 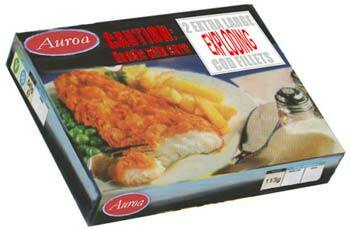 Zannussi: We're all very proud of our new Aurora range of frozen meals. The brand encompasses quite a large selection of products, offering the consumer excellent choice. Every item has been prepared to maximise vitamin and nutrient content, and we have managed to reduce salt and fat content without compromising taste. But what really sets the brand apart can be summed up in one word - 'fun'. University of the Bleeding Obvious: As we understand it, the range is uniquely designed to appeal to children? Zannussi: Well, that's rather a crude way of putting it, but yes. We have integrated the latest pyrotechnic technology into our products to create fully interactive meals, which will dazzle and amaze. Stick your fork into a potato fritter and it will shoot twenty feet into the air and explode to produce a spectacular burst of colour and light. Watch as our freshly frozen garden peas dance and fizzle on your plate. Gasp in delight as the steak and kidney pie spins round like a Catherine wheel, flinging out an aura of radiant stars. Dinner time is happy time. UBO: Are you quite sure about that? Zannussi: Oh most definitely. We've got the figures. Research shows that after consuming one of our meals, the average child is often up to 40% happier. UBO: The reason I ask is because of concerns about safety. During your initial trial period, when these meals were on sale in North Yorkshire, there were quite a number of well documented accidents - burns, lacerations and such like. Zannussi: And our research shows that they all occurred as a result of failure to comply with the correct handling instructions. We've since redesigned the packaging to emphasise the proper procedures for preparing and consuming the product. UBO: Instructions such as 'Stand well back' and 'Once lit, do not return'? Mr Zannussi, don't you think that stipulating these meals should be observed from a distance of not less than 15 feet makes them rather difficult to eat? Zannussi: It has its own problems, certainly - which is why we are offering people a custom-designed telescopic fork. All they have to do is collect six tokens from the back of special boxes. We are anticipating that this will be a very popular offer. In our survey, over 80% of our sample said that they'd be happy to eat their dinner with a telescopic fork. We have bar charts. UBO: Very well, let's move on to the problem presented by some of the ingredients. Zannussi: We try to use natural ingredients wherever possible, but certain preservatives are necessary to extend shelf life. UBO: I was thinking rather more about the large quantities of gunpowder, sulphur and various other noxious chemicals that are present in these meals. I am not a chemist myself, Mr Zannussi, but I strongly suspect that such substances are extremely injurious to health. Then, of course, there is always the risk of these foodstuffs being ignited once they have entered the digestive system. Zannussi: These kinds of worries beleaguer many new products, but usually turn out to be unfounded. I remember many concerns surrounding a lot of those 'just-add-boiling-water' instant meals when they first came out. UBO: That's as may be, but I don't recall a Pot Noodle ever killing anybody. Your new meals have already been associated with at least one death. UBO: I'm referring to fourteen-year-old Daniel Peasgood of Halifax. Zannussi: Ah now, strictly speaking, young Daniel is missing, not dead. Nobody's seen him since the 'incident' and I don't think it would be prudent to assume his demise until they have recovered a body. UBO: They found his trousers in Redcar. Zannussi: Well, you know what teenagers are like. UBO: So, in summary, despite the objections and the obvious dangers, you are still determined to press ahead with the nationwide launch of the Aurora range? Zannussi: Certainly we are. Oh, I'm aware that the product has problems. Our carrots - for instance - are highly unstable and are prone to explode on contact with gravy. Our cottage pie has experienced particular difficulties, and has a tendency to fly off in random directions when it reaches temperatures in excess of 80°C. And Lord knows what would happen if our sprouts ever fell into the hands of terrorists. But, taking all this into consideration, I firmly believe the benefits far outweigh the problems. I think the sheer thrill of watching your meat and two veg lift off its plate in a shower of sparks and engulf the dinner table in a furious festival of lights before consuming itself in a white-hot fireball is well worth the loss of the odd eyebrow or two. Don't you?